Megan Morris - Tips, ideas & inspiration for home and event styling. Tips, ideas & inspiration for home and event styling. Supermodel Alessandra Ambrosio decided to put down roots in California with her two children, Anja and Noah. 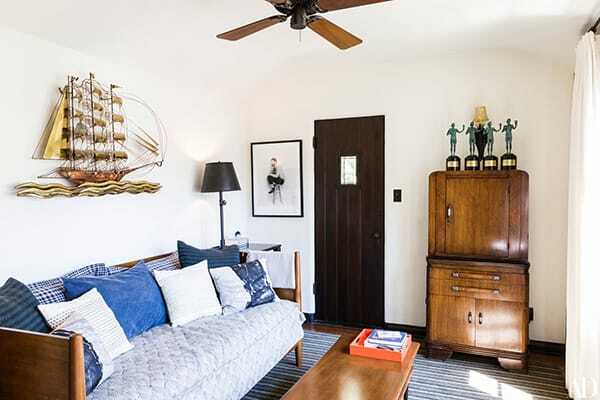 Originally from Brazil, she loved the similarities Santa Monica had with her native country, so she found a 1920’s Spanish bungalow that she transformed with the help of designer Martyn Lawrence Bullard. The result is a warm home full of charm, character, and fun. Martyn incorporated the free-spirited nature of Alessandra and her children with elegant design to create something unique to them. You can feel the Brazilian influence in the home along with other elements inspired by Alessandra’s global travels. The home manages to capture a sense of glamour while also feeling completely comfortable and accessible to her children. Enjoy this beautiful, inspiring home tour courtesy of Architectural Digest. The family room feels cozy and inviting for the entire family with plenty of seating and comfortable textiles. The entrance to the home is full of charm and beautiful foliage that welcomes you right in. 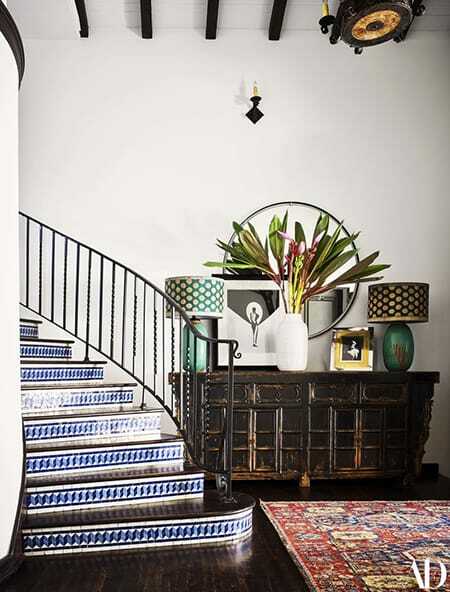 Stunning blue tile leads you up the staircase while a beautiful vignette sets the tone for the rest of the home. The Juliet balcony is one of the many charming features in the home’s classic California architecture. 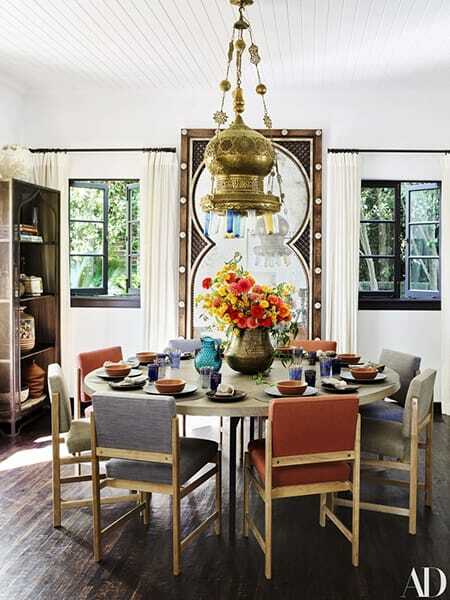 A stunning Moroccan pendant is the focal point for the eclectic, colorful dining room. 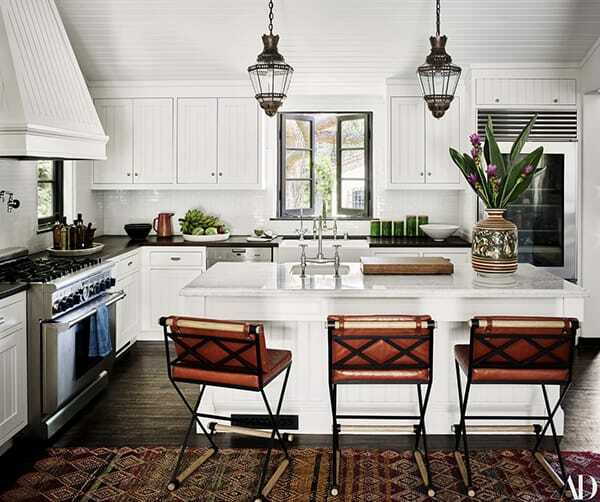 The Moroccan influence flows into the kitchen with two more pendants and rich, spicy accents. The pool cabana adopts an island flair with stunning blue walls and wood accents. 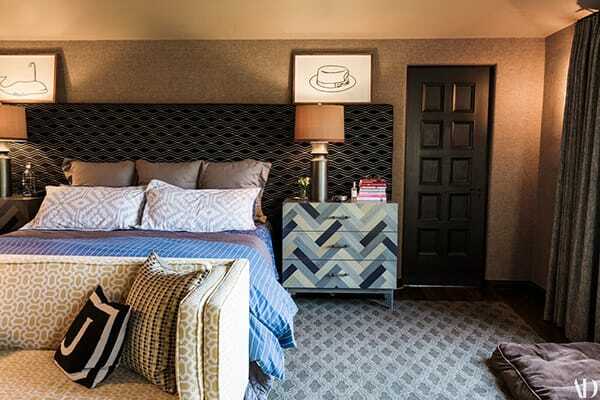 The master bedroom embraces a black and white palette but injects plenty of personality with texture and pattern. The master bathroom includes more Moroccan touches and the same charm as the rest of the home with a hint of glamour. 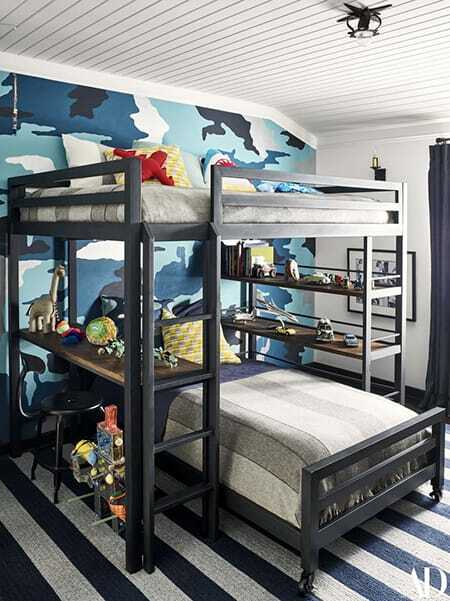 Her son’s bedroom features a blue camouflage mural and a fun bunk bed with tons of space to play. Her daughter’s bedroom is all Hollywood glamour with bright pops of fuchsia and hot pink. The pool area looks like a slice of a luxury resort with a bohemian twist. Another outdoor area is more intimate and cozy for great conversation. 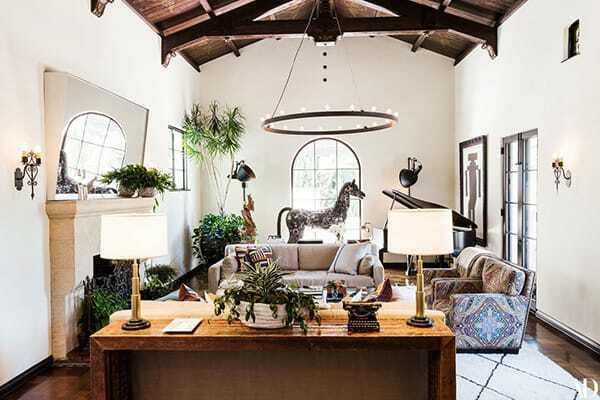 Actor Jesse Tyler Ferguson and his husband Justin Mikita worked with Will & Grace set decorator Peter Gurski to turn their 1928 Spanish Colonial home into a place that combined the couple’s personal styles into one harmonious residence. 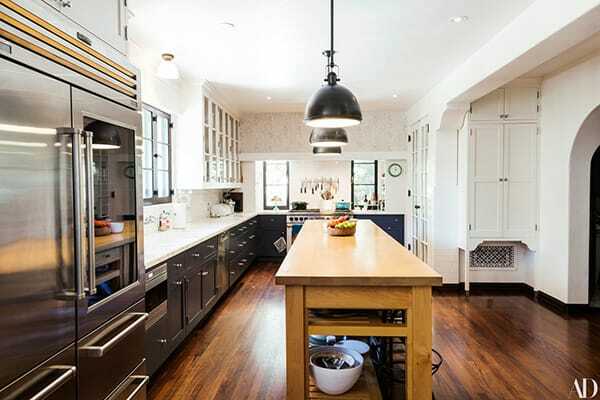 The result is a home that respects the beauty of the home’s original architecture and character while expressing the couple’s unique personalities and sense of humor. The home is a place full of quirky finds, stunning design, and a wonderful sense of warmth. It’s easy to imagine relaxing in it after a long day and throwing fabulous dinner parties, which the couple loves to do. It is a spacious 5,000 square feet yet it feels cozy and inviting thanks to the great use of pattern, texture, and styling. From the moment you walk up to the front door all the way to the backyard, it’s a charming, unique home that is sure to inspire you. 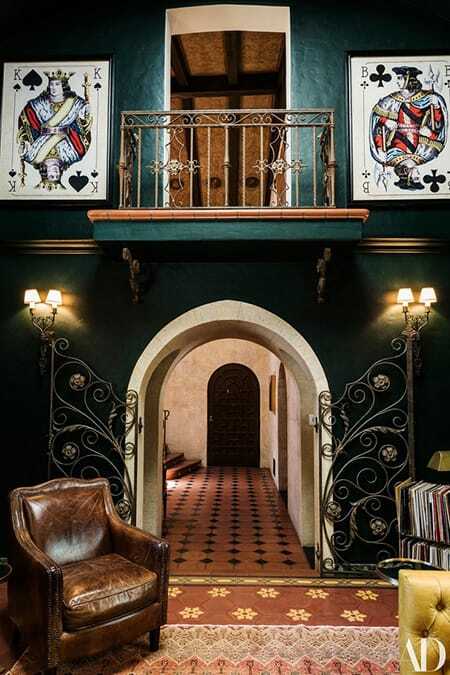 Enjoy this beautiful and unique home tour courtesy of Architectural Digest. 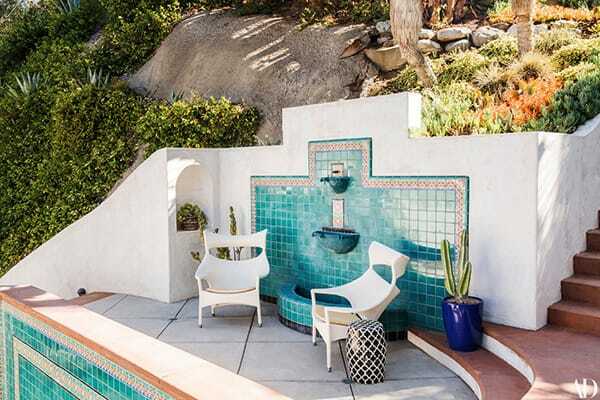 A charming fountain offers a tranquil seating area in the private backyard. 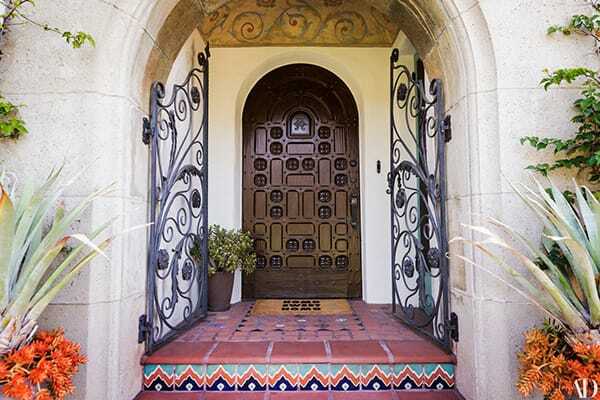 The entrance to the home is full of stunning details like wrought iron, woodwork, and Spanish tile. The library is a masculine space with rich colors and textures. More ironwork is present in the library, giving it extra character and a touch of elegance. 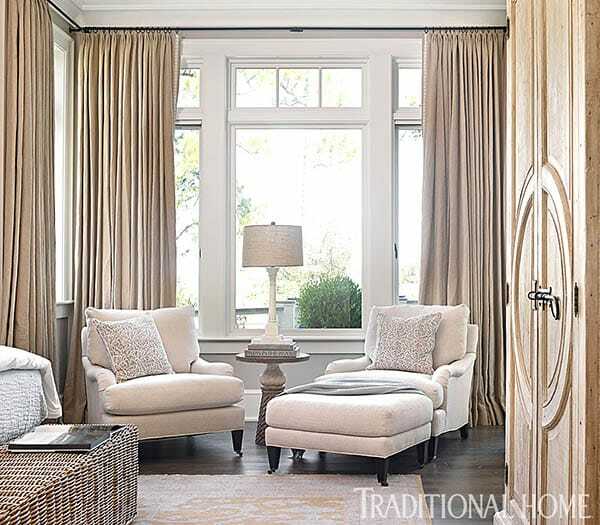 The living room takes on a lighter color palette with white and neutrals for a bright, traditional space. 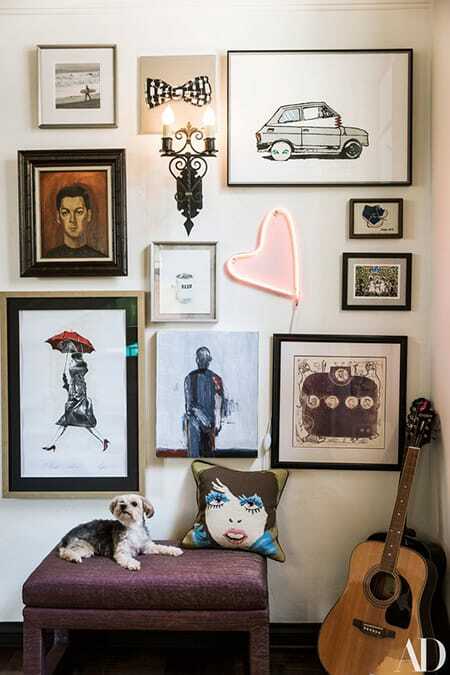 A gallery wall brings a lot of personality to this corner. 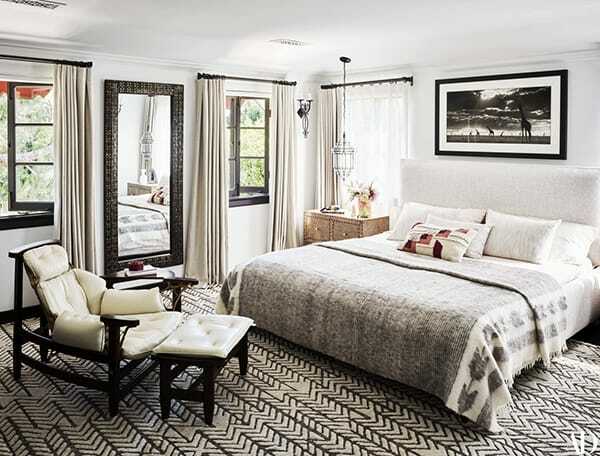 The master bedroom is full of cozy textiles and a beautiful mixture of patterns. 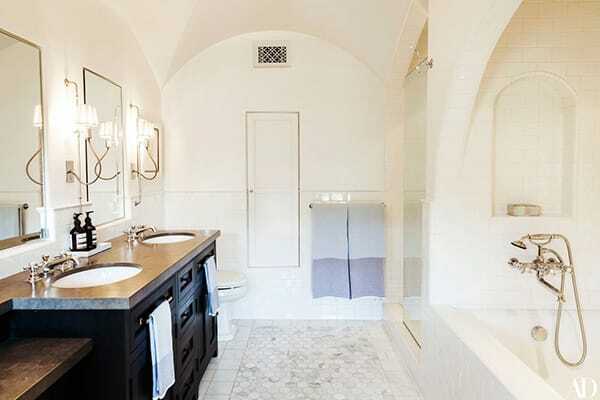 A white bathroom creates a tranquil, elegant atmosphere. The guest bedroom is equally as comfortable as the rest of the home with a fun pop of color in the bedding. Another smaller guest room is still charming and cozy with a daybed and Jesse’s collection of Emmy’s. The kitchen has a gourmet layout that can definitely facilitate incredible parties. Who wouldn’t love to curl up in this space and watch a movie? 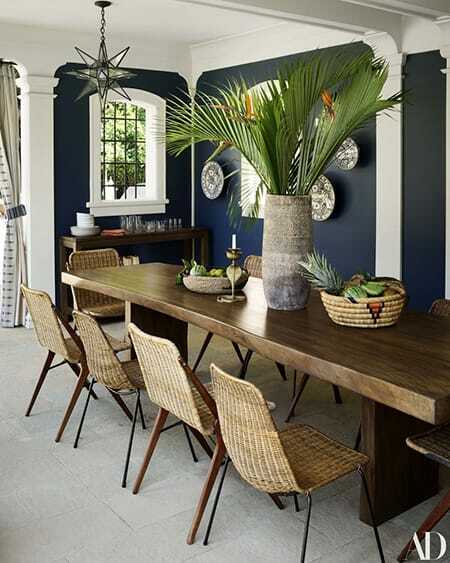 The dining room is dark and moody with a gorgeous masculine color palette. 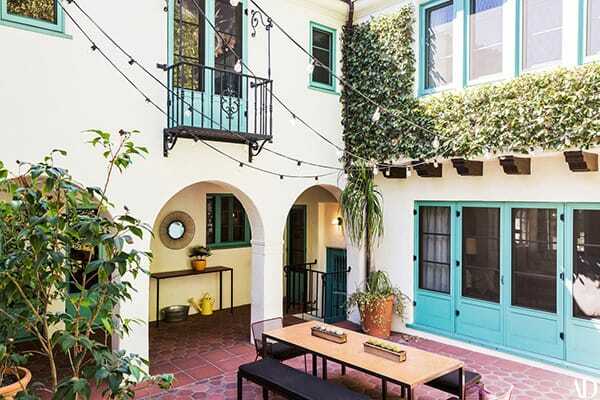 The courtyard looks like a set from a movie and is the perfect spot for entertaining. What a stunning a home with so much character! Filmmaker Casey Neistat is known for being one of YouTube’s most prominent creators. His adventurous, rough-around-the-edges style and creative way of telling stories has made him stand out from the crowd. Many people know his studio from his videos, which is urban and chaotic, but he wanted his home to be the complete “antithesis” of that space. He and his wife, Candice Pool hired designer Daun Curry to help them create a slice of serenity in the middle of the busy city. 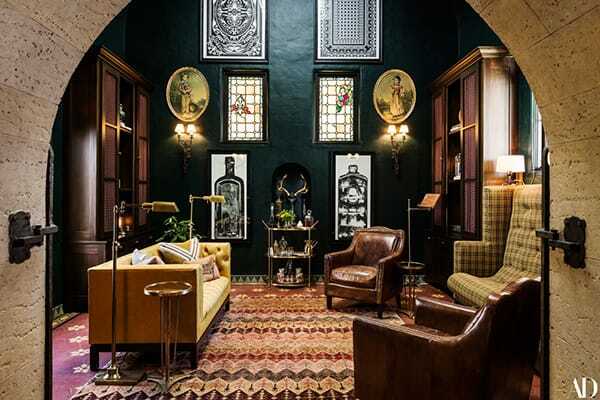 The result is a beautiful, elegant home with a bohemian flair. The couple wanted the space to feel like a retreat from their busy lives so they embraced modern lines and minimalist sensibilities. However, it is balanced by charming architectural elements to give it a sense of warmth and character. Here is the inspiring tour of their home courtesy of Architectural Digest. Matte-black wainscoting set low on the walls adds some dimension to the space while the white keeps it feeling open and serene. 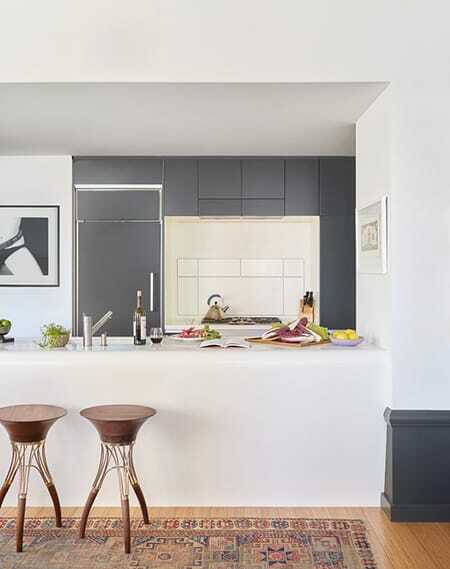 A modern kitchen in grey and white keeps things clean and streamlined. A gorgeous red and white chinoiserie wallpaper gives the hallway a punch of character. 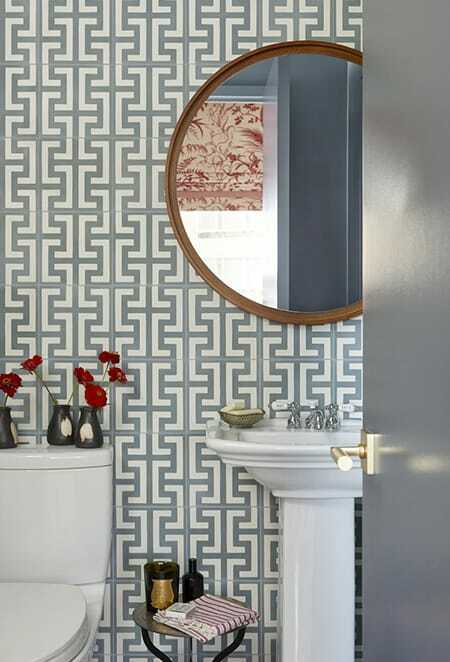 A geometric pattern in the bathroom is eye-catching yet still keeps with the clean design. Black built-ins create the perfect window seat and place for extra storage. The home office makes smart use of the space with flat-faced built-ins and plenty of storage. Their daughter’s bedroom is pretty in pink with shelving and storage for her many stuffed animals. Floor-to-ceiling pink drapes frame the great windows allowing in plenty of natural light. Subtle stripes in the wallpaper are imperfect when you look closely, giving it a clean yet casual appeal. 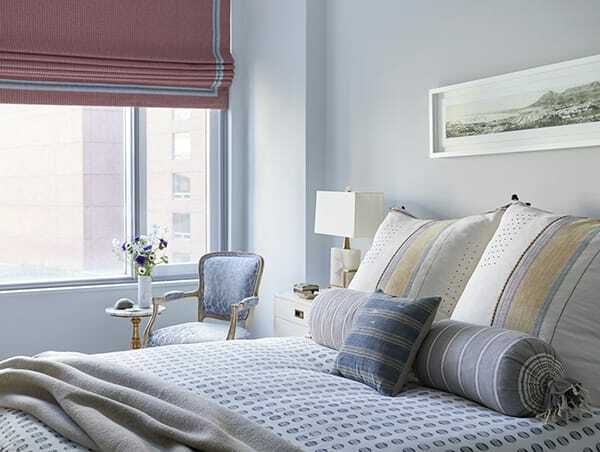 Soft blues in one of the bedrooms create a relaxing, serene atmosphere. The living room is a picture of elegance but still feels like a comfortable place you can unwind in after a long day. 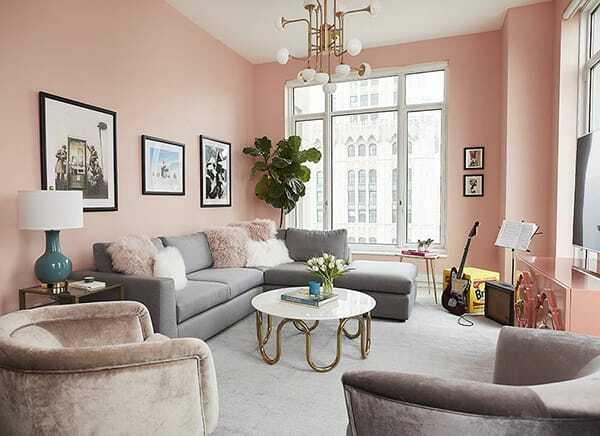 Actress Ashley Benson recently redecorated her New York City apartment to be the perfect escape from the busy city. The result is a chic reflection of her that offers her a space to relax, entertain, and practice playing the guitar. Coral walls engulf the main living area in a stylish, cheerful glow while modern furniture and gold accents bring an understated, glamorous flair to the space. The entire apartment is the perfect space for a young woman to call home. It’s easy to imagine having stylish dinner parties as well as relaxing there after a long, stressful day. It strikes the perfect balance. And although it is feminine, it isn’t overly so. The streamlined, modern furniture keeps it simple while other elements inject a fun, flirty vibe. Enjoy this inspiring home tour courtesy of My Domaine. Soft coral walls create a feminine space that exudes a cheerful sense of glamour. The console table below the television melts into the walls while gold touches bring an old Hollywood appeal to the space. The bar cart is simple yet glamorous, especially when paired with a pop art illustration of Marilyn Monroe. 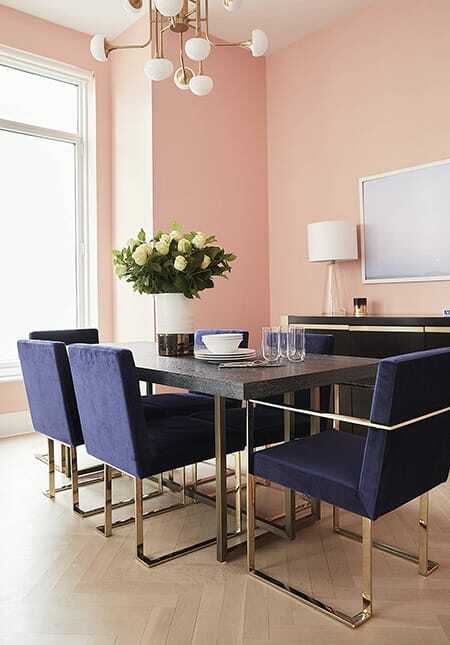 A mid-century modern table in the dining room is elegant yet understated and brings a swanky vibe to the room. 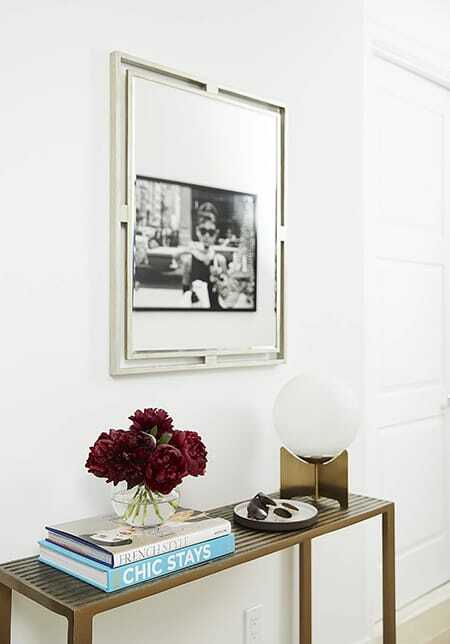 A console table by the front door displays chic books, gold accents, and a perfect spot to drop your sunglasses on the way in. 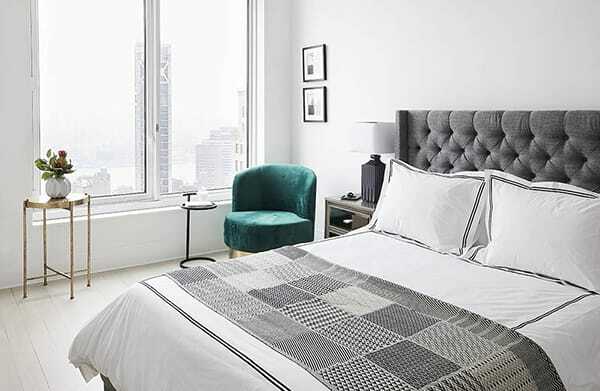 The guest bedroom is understated with a grey bed and minimal decor, allowing the emerald green accent chair to pop. Ashley’s bedroom is also understated with a more glamorous twist, bringing in the gold accents again and a luxurious tufted headboard. 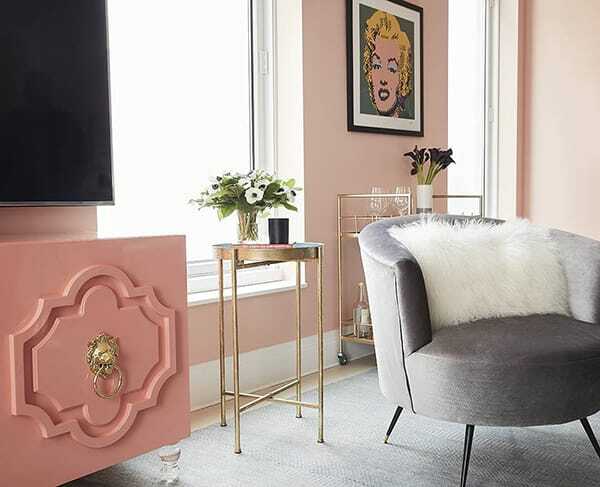 In one corner of Ashley’s bedroom, a blush pink chair and fluffy ottoman with gold touches bring in that Hollywood Regency flair. 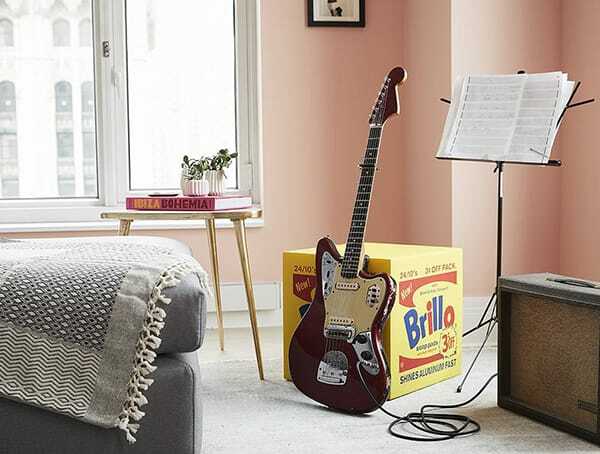 In the living room, Ashley loves to practice playing guitar, so one corner is devoted to it with a stylish, pop art-inspired touch. What a fun, fashionable space! The main focus of your bedroom is relaxation. It’s your private, personal space where you can go to unwind and refresh. 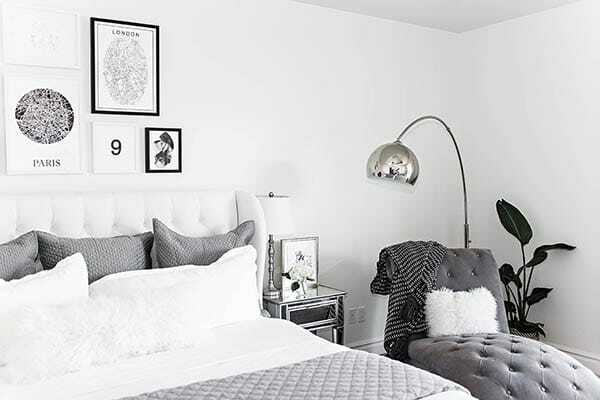 The bed is the main focal point of the room but sometimes, you may just want to read a book and have a glass of wine before bed or enjoy a cup of coffee in the morning before you get your day started. That’s where having a seating area comes in handy. A bedroom seating area can be as little or as large as you need it to be (or have space to accommodate). If your space is limited, a simple armchair or chaise will do the trick. If you have more flex space, you could set up an entirely separate living area in your bedroom. There are a lot of options depending on your needs and the available space. 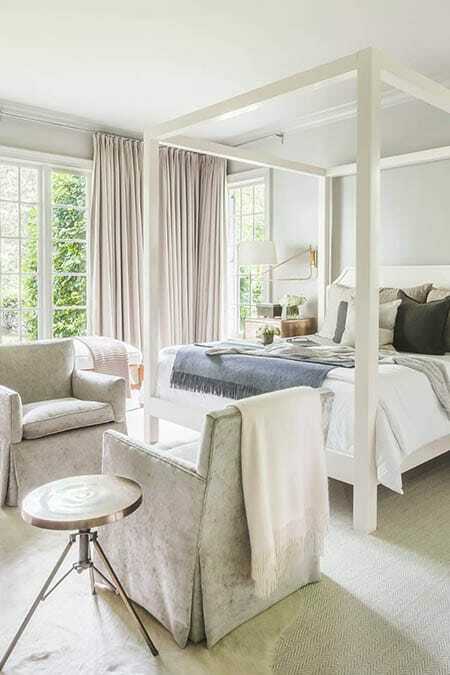 Here are some inspiring bedrooms with seating areas of all types to give you some ideas. A chaise offers the perfect spot for reading before bed. 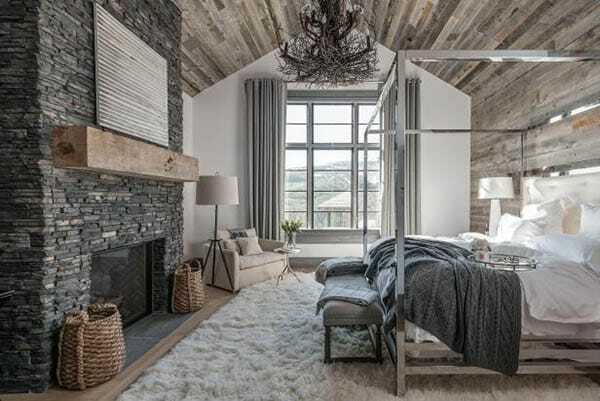 This dreamy bedroom is the perfect retreat from the world. A cozy seating arrangement by the window offers a spot for coffee in the morning or wine at night to wind down after a long day. The modern furniture in the seating arrangement brings a nice contrast to the more ornate styles in the space. 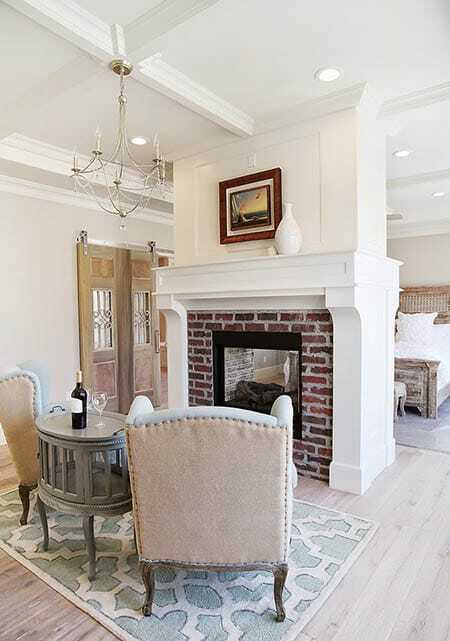 A charming fireplace between the bedroom and seating area helps define each space. The alcove is a nice, unexpected touch in the bedroom and creates a separate little living area. A wide chair in the corner is perfect for curling up in to read a book. Two black chairs were the perfect way to take advantage of the gorgeous bay windows. If you have a lot of room at the foot of the bed, two chairs are a great way to make the most of it. This bedroom’s lovely seating area is complete with a cozy fireplace. A seating area has a way of making a bedroom feel that much cozier.